Mattei’s rotary vane air compressors are the leading solution for countless commercial, industrial, OEM and transit applications, throughout a diverse range of industries—and our value proposition explains why. Looking to cut costs? Look no further. Mattei’s ultra-efficient rotary vane compressors won’t leave your wallet empty. By combining a superior design and our innovative vane technology, we have developed the most reliable, durable and efficient vane air compressors available today. Unmatched Efficiency: Mattei systems are the most energy efficient compressors available on the market. The low rotational speed of the compressor unit, the high volumetric efficiency and the complete absence of roller or thrust bearings, results in an energy savings of more than 15%. Superior Design: The superior design of Mattei’s rotary vane compressors ensures they are reliable and durable—and can reach 100,000 hours life without the need to replace any blades or other metal parts. The long operating life of a Mattei compressor is assured by high quality machining, which is the essence of rotary vane air compressors. Mattei's rotary vane air compressors are also incredibly silent and compact, so require little space and can be installed quickly and easily. Additionally, their accessible design makes maintenance operations simple and straightforward. Unrivaled Performance: All Mattei compressors have a 1:1 ratio between the electric motor speed and that of the airend, which means enhanced performance and efficiency. Furthermore, the durable design of Mattei units means you won’t see a reduction in their performance over time. 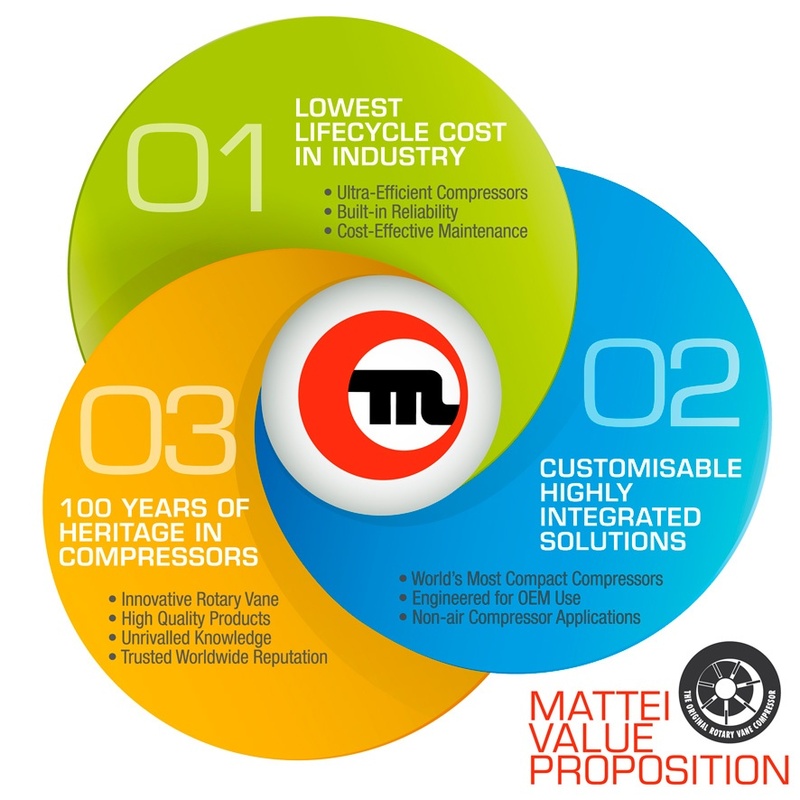 With Mattei, you will be buying your last compressor first. Mattei has the solution you need. Our rotary vane air compressors are the leading systems for commercial, industrial, OEM and transit applications. The Air Center (AC) Series sets a new standard in air compressors with sophisticated high-efficiency performance, quiet dependable operation and low maintenance. The BLADE Series compressor range, with operating pressures from 8 to 13 bar, is the ideal solution for the needs of small- and medium-sized companies, as well as artisan businesses. Our Classic Series is comprised of our ERC compressor systems; traditional open-frame air compressors designed for performance and value. Known for reliability, each features sleek in-line construction, simple controls, dependable operation and low maintenance. The High-Efficiency Series, which contains our cutting-edge MAXIMA system, offers reliable delivery of air, even during continuous use. This energy saver is ideal as a base load machine and unrivaled in combination when using an energy-saving OPTIMA VSD compressor as a trim machine. The Variable Speed Series offers reliable delivery of air for variable use compressors. The OPTIMA Series leverages the superior mechanical efficiencies engineered into Mattei’s rotary vane technology to lower your operating costs, particularly when compared to typical rotary screw air compressors. Mattei also offers Air & Gas Compressors through our Special Applications Series. In addition to our rotary vane systems engineered for OEM use, we also offer custom-tailored solutions to meet our customers’ unique and specific requirements. Mattei is the only 1.5 to 250 kW rotary vane manufacturer in the world. Through more than 100 years, we have successfully provided high-quality vane systems for countless industries and markets throughout the world. Over a century of experience, combined with our rotary vane expertise, means we can provide you with the best high-quality solution for your unique application. Get your last air compressor, first. Contact Mattei today.